Co-op is making a comeback in 2018, but is there a place for games that rely so heavily on working with friends? I probably don't need to remind you that life can be a busy, unpredictable, and sometimes uncontrollable series of events; a frenetic balancing act, as you juggle your time between work, family, friends, recreation, health, and a billion other things all at once. As someone currently tasked with organising a Stag Do, I am particularly attuned to how hard it can be to get several people together in the same place at once, but video games are asking us to do this all the time. Last year, Star Trek: Bridge Crew's playability banks on four friends each owning a PS4 or high end PC, a VR headset, and their own separate copy of the game, and that's before having to find a good time to play together when every person is available for at least an hour or more. 1-2 Switch brandished a AAA price tag for an experience that can only really be enjoyed at social gatherings or parties tame enough to bring your new Ninty console out without fear of it getting trampled or splattered with alcohol. In 2018, too, games are getting more ambitious and socially oriented with their multiplayer components, and while that’s great in theory, it’s easy to wonder whether there’s a sufficient audience for experiences that require certain criteria to be fulfilled before they can be enjoyed as intended. In March, Sea of Thieves and A Way Out release within just a few days of each other. The first is a game that emphasises playing as pirate crews of (ideally) five or more people, together manning a single ship and progressing in the online world through communication, coordination, and extended co-operation. 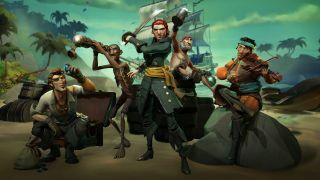 Players can jump into Sea of Thieves solo, but Rare itself has admitted that the game is best enjoyed with friends, since much of it has been designed specifically with this kind of collective play in mind, while lone pirating actually limits how far you can progress in your swashbuckling career. "Games are getting more ambitious and socially oriented with their multiplayer components"
I played a demo at E3 a few years ago and, when everything came together, as my team battled two other ships each controlled by another crew of real players, Sea of Thieves was momentarily magical, but it’s hard to picture that kind of experience sustaining itself once the game releases. Not only will you need to gather together a group of committed friends online to build your own crew, but the staying power of Sea of Thieves’ social world is dependent on it being populated by hundreds of similarly player-controlled crews. The question is whether Rare has overestimated the size of its target audience; that audience being groups of friends who are all willing to commit to each buying the same game and playing together on a regular basis with shared in-game agendas. I hope my doubts about Sea of Thieves are proved wrong come March. Then there’s A Way Out; a game which can only be played as a split-screen co-op experience, either online or through local play. That immediately sounds like both a creative and professional risk, but a recent announcement from Hazelight demonstrates how developers are attempting to circumvent the practical limitations of their co-op focused titles. Creative Director Josef Fares infamously took to the stage at last year’s Video Game Awards to announce a “friends pass free trial” for A Way Out, allowing those who buy the game to invite another friend to play with them online for free. Essentially, you’re getting two copies for the price of one, and a skeptic might look at that as EA potentially halving the sales of its latest game. On the contrary, I think this is EA playing the long game. By dropping the ‘one copy per player’ barrier for entry, Hazelight has only opened up the appeal of A Way Out to a wider audience, as those who were put off by the need to persuade another friend to buy the game are now far more likely to pick it up, confident that they’ll be able to enjoy the experience with another companion now that they have a free copy to give away. Sure, this is still a co-op game which requires two dedicated players to see the journey through from beginning to end, but a major concern people had for A Way Out has now been remedied by this smart business initiative, and the game will be all the better for it. Later on in the year, you have games like Anthem, State of Decay 2, and Overkill’s The Walking Dead, all of which are also primarily pitched as co-op centric games, though all of these can be played solo. But where are all these cooperative, socially oriented games coming from? Like many trends in the industry at present, the answer lies at the doorstep of Destiny. Shared world, persistent multiplayer, public gameplay… these are buzzwords increasingly being ripped straight from Bungie’s playbook, acting as conceptual springboards for developers to iterate upon popular trends. The crucial difference is that Destiny 2’s infrastructure has made the game a viable (if uneven) experience for solo players as much as fireteams, with Guided Games, Clans, and revamped storytelling all part of Bungie’s efforts to cater to the lone wolf as much as the pack. It remains to be seen whether the same can be said of 2018’s upcoming roster of co-op titles. If Sea of Thieves is attempting to simulate the experience of belonging to a pirate crew, what kind of game will that be for a solitary skipper? When Overkill’s website specifically states that “teamwork is paramount” for its “four player co-op action FPS” The Walking Dead, can solo play really be that fulfilling when fighting alongside three other strangers or non-human bots? And does BioWare really believe that the idealistic cooperation dramatised in Anthem’s reveal trailer, with that simulated in-game chat performed very clearly by trained actors, is truly indicative of how people are going to play its game? As a co-op fan, I couldn’t be happier that these kind of experiences are finding new life through a variety of different genres and formats. But as someone more than familiar with the discrepancies between the promise of co-op game’s ambition and the realities of its impact (*COUGH* Evolve *COUGH*), I couldn’t be more nervous about their chances of success.